What basic knowledge and literacy gaps about Islam are important to fill for American Muslim youth and what resources already exist? In the United States, children live in an increasingly diverse and pluralistic environment, and need to be, 'equipped with an understanding of various religions' and their place in today's world. Although teaching about religion should be a critical part of the school curricula, educators sometimes avoid teaching about religion because of the fuzziness regarding the line between church and state. As a result, children's general knowledge of religion is limited. This environment of limited religious knowledge promotes intolerance, fear, and hate of religion— particularly Islam. Many American Muslim youth learn about Islam and their own religious traditions and heritage at home and in part-time and full-time Islamic schools. However, they may not be gaining a broad foundational understanding of their non-Muslim peers' religious traditions and heritages in school. 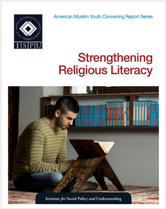 This report is focused on the importance of Islamic literacy for American Muslim youth and identifies resources that exist, literacy gaps that need to be filled, and challenges to overcome.